We may not have had Santana, The Who, The Jefferson Airplane or Jimi Hendrix performing (Hey! Didn't Rod Mar use "Purple Haze in his slide show???)... but we did have Peter Read Miller. And Andy Hayt. And Wally Skalij. And Robert Beck. And Dave Black. And Rick Rickman. And Robert Seale. And Jack Gruber And a cast of hundreds! It wasn't "three days of love and music" ... it was the Sports Shooter Workshop & Luau 2002. What an incredible two days in Manhattan Beach this past weekend, a faculty and staff of 25 and 275 students and working professionals hungry to hear and learn from the best in the business. - Peter Read Miller (Sports Illustrated): The "Master of the 600mm on the Gird Iron" dazzled the crowd with a career retrospective of unbelievable football images and his use of light on the field. He also let us know that painting world class Olympic athletes GOLD isn't as hard as you'd think ... until they try to wash it off. - Wally Skalij (Los Angeles Times): Showed us that sports photography isn't just about crashing bodies and slam dunks, that there are deeper messages and many levels of emotions that we can capture to show our readers. - Robert Beck (Sports Illustrated): Great sports photography isn't made only at NBA, NFL and Major League Baseball games. Unique, visually interesting and emotional photos can be made at beach volleyball, surfing, extreme sports and at yes, skate boarding. - Andy Hayt (NBA and San Diego Padres): Respect your subjects. Talk to your subjects like they are "real people". Respect the sports that you are covering. Don't let yourself be pigeonholed into a style of photography that is unfulfilling and does allow you to grow. - Dave Black (Freelance): Showed us the beauty of figure skating and other Olympic sports, making the difficult shot in difficult conditions look easy. - Jack Gruber (USA TODAY): Covering an Olympics is grueling, with long days and hard work. Planning and team work is essential. But to survive, you must take care of yourself while you're working. - Robert Seale (The Sporting News): Lighting can be simple and still be elegant. You don't need high powered equipment to make beautiful portraits, sometimes all it takes is just getting that strobe off of your hot shoe. - Trent Nelson (Salt Lake Tribune): Showed us those little tricks and short cuts that only seasoned veterans of the road know. Archiving and saving your images is just as important as making them in the first place. - Ronal Taniwaki (Nikon): Taught us the care and feeding of our digital cameras and that if we treat our batteries nicely, they will treat us nice as well. - Mark J. Terrill (Associated Press): Using remote cameras for unique and interesting angles isn't just for Sports Illustrated photographers or for use at just major sports events. Whether you use an expensive radio trigger or 25 feet of zip cord, remotely mounted cameras can be used by anyone. - Bob Larson (Contra Costa Times): Getting to know your local prep teams (and their coaches!) can pay big dividends with great access and great photos. You don't have to cover the San Francisco 49ers to make great pictures, especially if you have De La Salle High (133 straight wins) right next door! - Rick Rickman (Freelance): Taught us that protecting our copyrights and determining our cost of doing business are two essential tasks we must first undertake when we go into the freelance market. Having a feel for your own self-worth is as important as knowing what film to use. - Brad Mangin (Freelance): Don't be satisfied with the usual photo positions. Look for that unusual spot for that unusual photo. Take a chance if you want to see those unique photos when you're chimping on the back of your digital camera. - Rod Mar (Seattle Times): Make the Big-Time where you are. 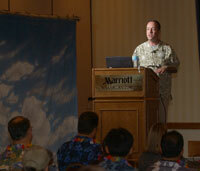 The Sports Shooter Workshop & Luau 2002 was a personal dream come true. I brought together two dozen of my friends who are not just great photographers, but wonderful people as well. They all gave freely of their time (plus they all paid their own expenses to get to Southern California) so they could educate, enlighten and enrich the lives of all of those that attended. It was a very special two days and hopefully, we'll be doing this again next year. Thanks to all of those of you that attended. And special thanks to all of the wonderful friends of mine that helped me put this thing on.